If you have been reading my blog for a little while, you know how much I have struggled in my search for an eyebrow product that would suit my eyebrow color (dark, ashy brown with a few grays), keep bald spots covered without smudging, last all day (because I feel naked when my brows start fading in the middle of the day), and made with “natural” ingredients. I am so excited I am going to scream it now — I FOUND IT! Sorry for yelling, but really, this is one of my best green beauty finds so far. Clearly, you already read the title of the post so you know it’s the 100% Pure new brow product called Long Last Brows*. Let me just begin by saying that this ain’t called Long Last without a reason. This stuff stays on until I take it off at night, and it needs a good makeup remover to dissolve. A few nights ago I was wearing so little makeup that I decided to skip on oil cleansing and used only my gentle face cleanser to cleanse my face. I didn’t even notice that I had not removed makeup from the eyebrows because I did massage them with cleanser, but my eyebrows were there the morning after, so you get the point–it truly lasts all day. The consistency of the product is like a brow wax (think of Ecobrow, Anastasia Beverly Hills Brow Pomade), although I find the texture of the 100% Pure Long Last Brows to be slightly softer. Though that would typically indicate that the product is prone to smudging/fading, I have not had any smudging or fading issues. It’s just a bit creamier. Color-wise, I can only speak for the shade that I am using, Medium Brown, because I don’t have the others (sorry!). However, I am excited to say that this is a fantastic shade for my eyebrow color. It’s a dark brown, but not so dark that it looks harsh. It is ashy, but not gray–it looks very natural. 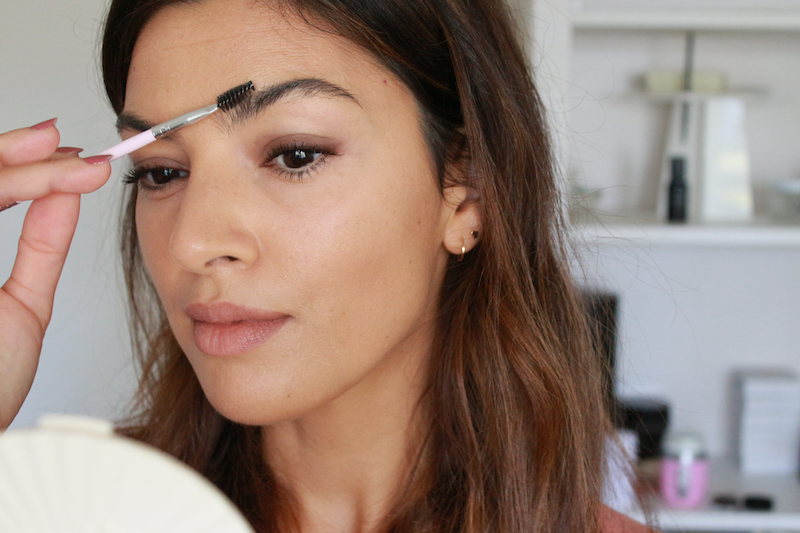 Just have a look at the photos, which to me, are the ultimate test to see how a brow product really looks on my face. In my few years of beauty blogging I have learned that in makeup, mirrors act like those friends that don’t tell you when your foundation doesn’t match your neck or you have lipstick on your teeth. Photos are your true friends, they tell you exactly how it is, (although sometimes they are a little too honest, you know what I mean?). So when I saw how natural it looked in photo I understood this was a great match for me. I highly recommend Medium Brown if you have dark brown hair. It’s a great, great color. The pigmentation is really nice and the color rich, but not so rich that in one swipe your eyebrows look too strong. Compared to other brow waxes it is slightly less pigmented, but that makes it look more natural. And you can totally build it up to get more coverage. It works almost like a brow powder, but with a creamier texture. I should also mention that this product comes in a generous size (0.15 oz), and since the tiniest amount of product is needed for each application, I expect it to last for a very long time. It contains no water, but features some good emollient and conditioning oils (Castor, Coconut, Marula), so I don’t foresee the texture getting dry over time. I will update this post in a few months if I notice any changes. The application is super-easy, because again, the consistency is creamy and the pigmentation is just right. 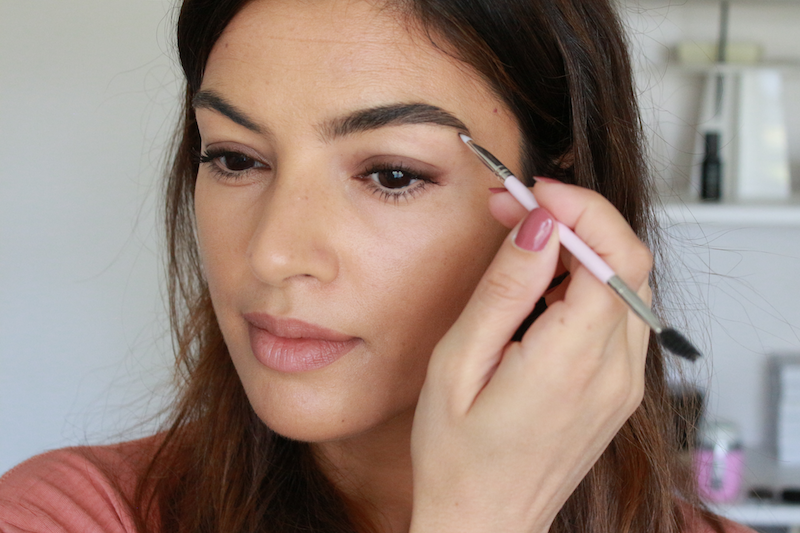 I pick up some product with an angled brush, and fill-in any empty spots in my eyebrows with dash-like strokes. Then I blend the color in with the spoolie side of the brush, which makes it look more natural. Then I do a few shape corrections here an there, and voilá, I’m done. The product comes with a dual-ended brush with an angled side for filling and a spoolie side for brushing/setting, so you don’t need to buy a separate brush. And the brush (which is vegan) is great! Good size, only a bit stiff to get precise strokes, but not so hard that it will scratch the skin. The spoolie brush blends the product nicely. I use this brush to do my eyebrows, even though I own eyebrow brushes that cost $20-$30. 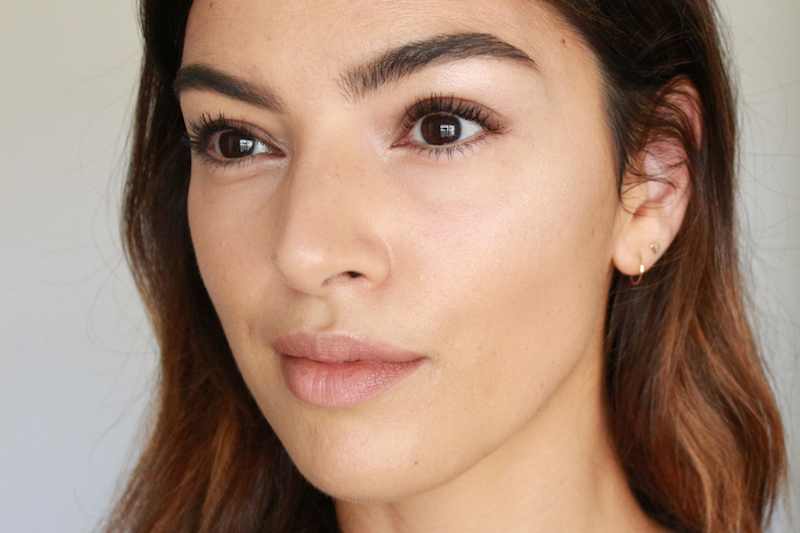 I expect you guys to ask me how it compares to Ecobrow, so here’s my thoughts. The products are very similar in concept because you get a jar with a colored brow wax inside and you have to apply it with a brush. 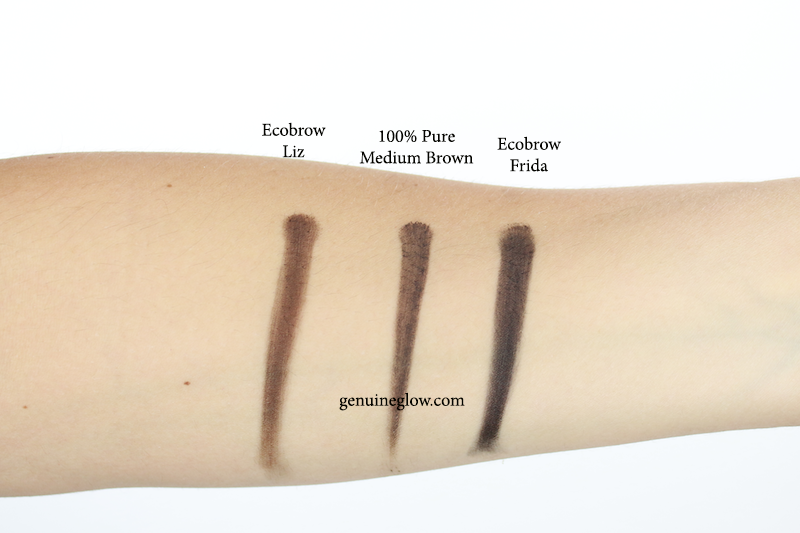 Color-wise, I find that the 100% Pure Long Last Brows in Medium Brown gives me a more natural look than Ecobrow in the shade Frida or Liz (the two I have used) because Frida is very dark, and with my current hair color it looks a bit too dark, and Liz a bit warmer than my eyebrow hairs. 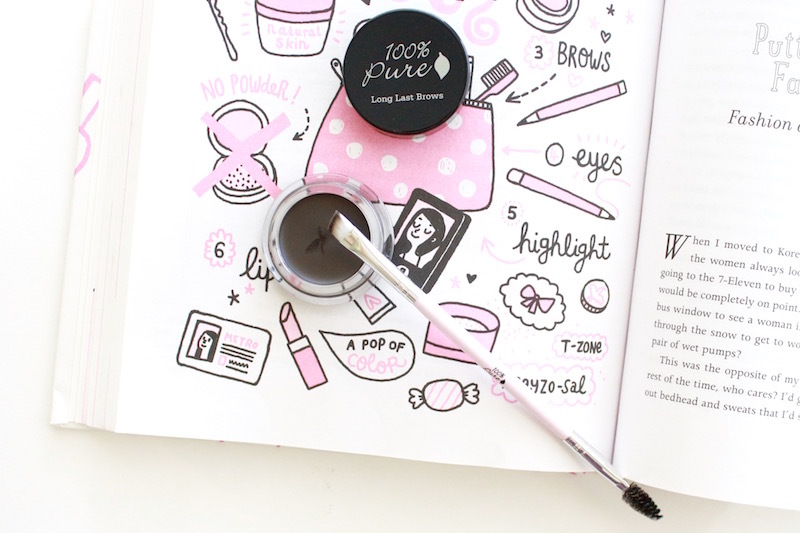 Additionally, 100% Pure Long Last Brows contains natural ingredients only, while Ecobrow contains a few ingredients that aren’t exactly green. Nothing that I am concerned about, to be honest, but I prefer green ingredients whenever the option exists and performs well. Lastly, 100% Pure Long Last Brows comes in a larger size than Ecobrow (0.15 oz vs. 0.121 oz). I am afraid that I don’t have anything negative to say about this product. I always find a little something that I don’t like about products, but I love this brow gel and I haven’t used anything else since I opened it. Would love to know if you guys have tried it and how your experience has been if you did, especially if you use a different shade (does it perform as great as the Medium Brown? ).